Trees do not like transplanting. If necessary, the move should take place in the fall, at the beginning of the dormancy. The tree may be at its current place for a maximum of four years. The trunk diameter directly above the ground must be smaller than that of a 0.33-liter beverage can. The dormancy must have started. Signs: The foliage is discarded, there is no fruit formation in evergreen plants, and there are no young shoots. Other trees and shrubs nearby lose the foliage. The soil must not be frozen. In Permafrost is unlikely to occur for the next four weeks. Measure and double the circumference of the trunk. Remove the circle with the radius thus determined around the tree. Remove the thickest branches from the crown. Overall, make a strong pruning of the crown carry out. Bind branches and twigs loosely together. Tie a band just above the ground around the tree. At the new location, make a pit with twice the diameter of the marked circle for dig out the roots. Prepare compost and potting soil next to the hole. After this preparation, it must be quick, because the roots should not be exposed unprotected to the air for a long time. Nevertheless, it is important to work carefully and without hassle, because those who work hastily hurt the roots more than absolutely necessary. For higher trees, a helper should hold the tree while digging. Using a spade, dig vertically along the previously marked line into the ground. Dig a ditch around this circle. Starting from the ditch, horizontally under the tree dig. Cut all roots, especially the fine roots, smoothly with a pair of scissors or a knife. Lift the tree out of the ground. Check the roots, cut off the frayed ends smoothly. Place the roots with adhering soil in a jute sack or a large one Weave the cloth. Tie the fabric together, as much earth as possible has to be moved. 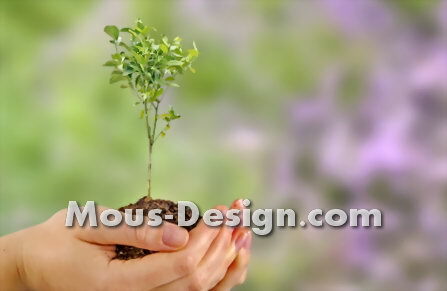 Only small trees or bushes can be planted by a gardener alone. It is always wise to have a helper hold the tree until the roots are in the ground. Check that the excavated plant hole is sufficiently large. Line the hole with compost and potting soil so that the roots find loose soil. Place roots in the hole without a cloth. The surface of the earth must be in line with the ribbon at the trunk. Fill the planting hole with the excavation and make a firm move. Remove the ribbon from the trunk. Drift three piles next to the tree into the mature soil. Tie the tree to the piles and free the crown from the lacing. Pour a small wall as a pouring edge around the planting hole. Fill the area within the pouring edge with water.